A house is not a home without artwork. The right pieces don’t just set the tone of your home, they also say something about you, and help you express who you are, and feel grounded in your space. So investing in some quality pieces that you love is important, and can be a lot of fun. That said, we don’t always want to ‘invest’ quite as much money as what all the lust-worthy pieces we see on Insta are going to set us back. Lucky for us, there is amazing artwork out there to suit every budget and every taste—it’s just finding them that’s the hard part. So to make it as easy as possible for you, we’ve rounded up some of our favourite artists, producing artwork available to buy from budget to blow-out. Enjoy! 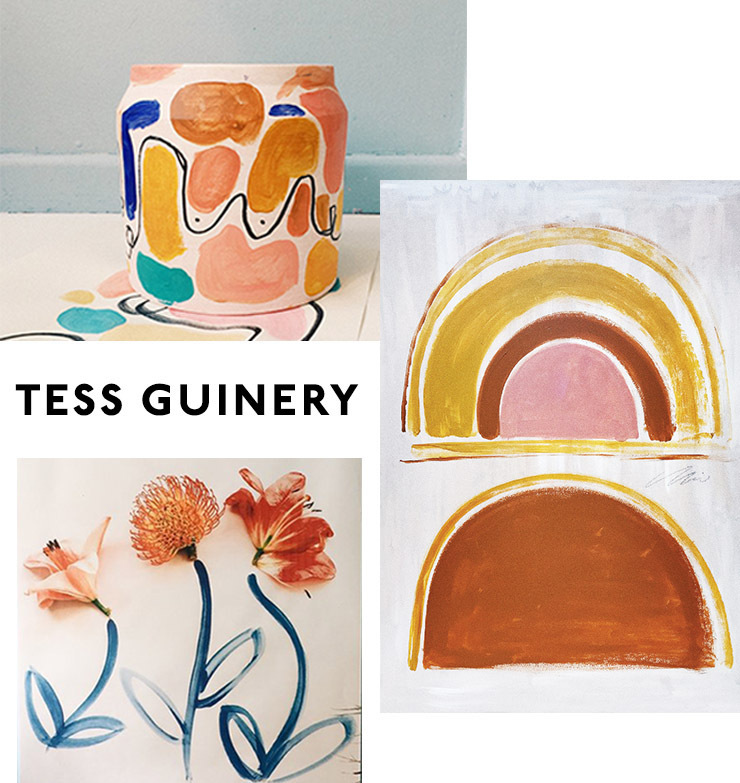 If your home needs a splash of colour and some inspiring words, Tess Guinery is your girl. A designer, self-labelled ‘dabbling’ artist and writer, you can grab prints and originals from Tess that combine all of these creative passions for as little as $20, and as much as about $350. Kambarni is an artist and illustrator descended from the Ballardong Noongar people of the South West of Australia and the Nimunburr and Yawuru people of the Kimberley. His artwork reflects the importance of cultural preservation and expression while also challenging the notion of culture being trapped in the past—so expect super contemporary, diverse pieces that play around with line and colour. Kambarni has a cultural and biological fascination with the natural world, and whips up some amazing pieces based on the native flora and fauna that’s endemic to Western Australia—from the ocean to the desert. Grab one of his prints starting from around $30, or commission a special piece just for you if you’ve got a bit more to spare! Kenesha Sneed is a Los Angeles based artist, producing a collection of handmade goods (think throws, ceramics, and tote bags) and artworks that, together, comprise Tactile Matter. Kenesha’s work is unique and recognisable—using bold, bright blocks of colour to depict scenes like women at the beach or drinking a cup of tea. She’s worked with some huge brands including Refinery 29, Facebook, Airbnb and H&M, but you can still pick up some of her stunning prints online for as little as $40. What a legend. If you’re looking to bring some fun into your home via artwork, you need to look into Sarana Haeata’s amazing watercolours. Her prints feature people dancing, smiling, doing yoga and getting piggy backs—among other things—and they all cost less than $50. She also does a whole lot of more ‘serious’ work, including some amazing acrylic on canvas stuff and beautiful ceramics. 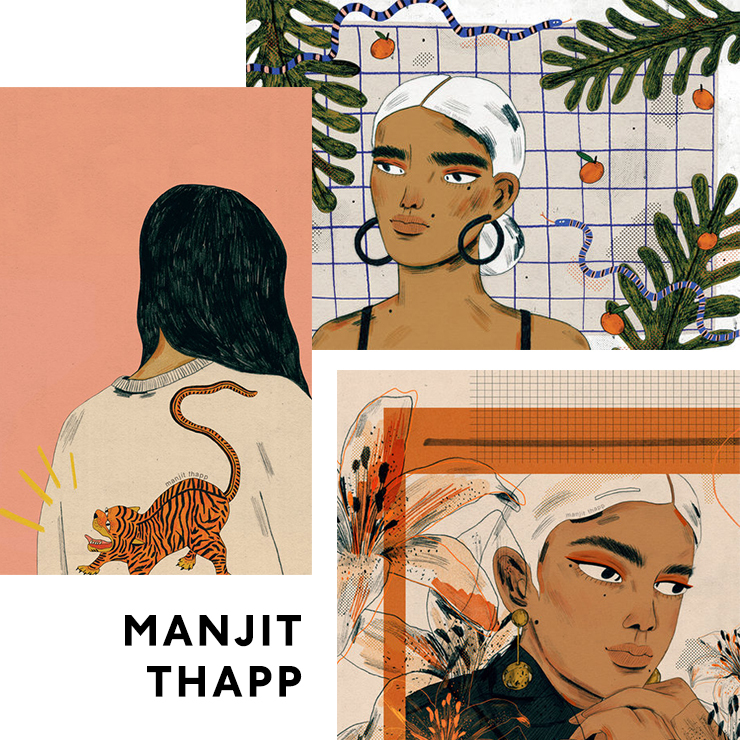 Amazing UK based artist Manjit Thapp is producing some incredible portraits, original illustrations and prints. Her portraits are a bit Frida Kahlo-esque; bold, bright, evocative and feminist. You can grab her illustrated zines and comics, small, medium and large prints and even phone cases featuring her artwork! She even has a series of prints depicting her favourite Wes Anderson scenes, which you can get in your choice of size from about as little as $15. Practicing out of his studio in Portland, Oregon, Benjamin Ewing is a multidisciplinary artist working in studio-art, photography, graphic and print design. His work is simple yet striking—minimalist, contemporary and perfect for those wanting to finish their place off with stylish detail. It’s the kind of monochromatic, linear work that you’re seeing all over your favourite IG account and it oozes cool. You can grab his current risograph prints from a series entitled ‘Take When We Can’t’ for just $50 each (though you should really get the whole set of three to complete the look), or enquire about his higher-end stuff. We suspect you won’t regret it. NG Collective Studio is made up of the artistic works of sisters Laura and Kristen—it’s a kind of ‘creative conversation’ between best friends, their very own visual language. Through layering, colour, stroke and a varied use of media, the sisters create abstract, figurative works that look great in a modern abode with a pastel palette. While many of their larger scale works sit in a higher price range, you can grab some of their ‘mini’ prints for around the $100 mark. An Australian artist who has exhibited and worked on public art projects all over the world, Kyle Hughes-Odgers’ work focuses on colour, spatial balance and movement. He works across various scales (everything from painting and drawing in the studio to large scale public artwork), but you can pick up an original artwork perfect for your home from just $250! Inspired largely by women in both their strength and vulnerability, Lucinda Jones creates stunning portraits and silhouettes in acrylic on canvas or paper. Using bright colours and a whole lot of negative space, Lucinda explores the duality of softness and strength in the modern female—and the result is simply beautiful. Think inverted black and white bodies in bikinis, bright orange nudes and electric blue girls eating pasta. Her originals on paper start from around $350, but DM her through Instagram for more info. 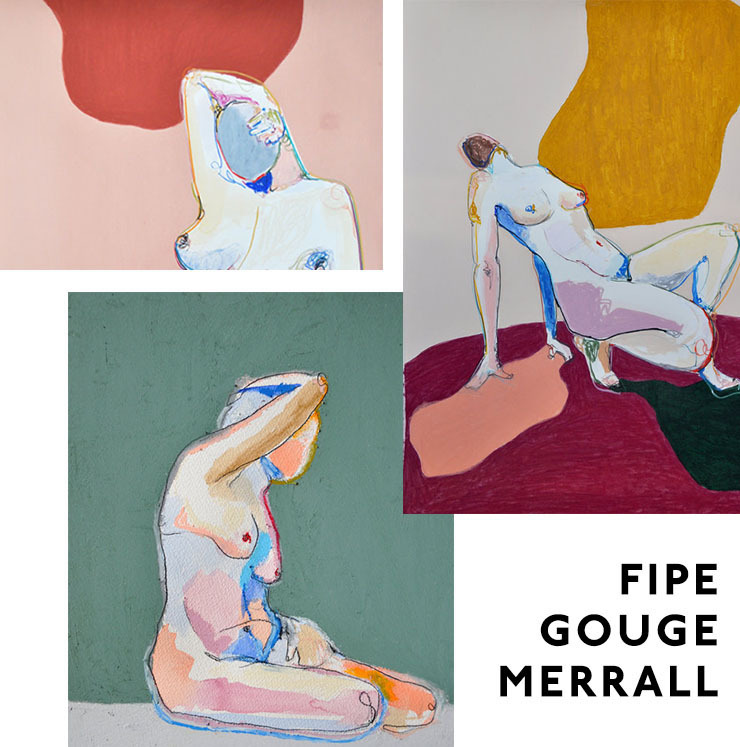 Sydney-born artist Fipe Gouge Merrall creates bold, colourful nudes, using a variety of materials like charcoal, watercolours, oil pastels and coloured chalk on paper. Some of her pieces are more minimalistic line drawings, while others use big blocks of bright colour to make for a statement piece. She sells her originals online for between $100 and $500. If natural tones are your vibe, you need to check out Lily Johannah Nicholson. She works across a range of mediums including watercolour, gouache, acrylic, house paints, crayon, pen and pencil, and explores colour palettes and mark making techniques inspired by the surrounds of her seaside farm in New South Wales. Her original works on paper range in size and price from extra small ($100) to large ($750). A Torres Strait Islander artist from Wollongong, NSW, Zachary Bennett-Brook is the award-winning artist behind Saltwater Dreamtime, producing work heavily inspired by the ocean and his contemporary Aboriginal culture. His work is visually striking, using bright colours and extremely precise lines, dots, shapes and patterns. One of his artworks will set you back between $200 and $500, or you can even commission his artwork for your surf or skate board! Based out of Byron Bay, Jai Vasicek is one of Australia’s most sought-after mixed-media artists, producing stunning paintings, prints, embellished crosses and decorative tiles. Most of his works are abstracted or embellished female portraits, use bright colours and layering techniques to create real statement pieces. While his large scale paintings can only be purchased at exhibitions or via enquiry (for the time being), Jai is also the curator behind Ahoy Trader, where you can choose from a smaller range of his creations—including prints starting from $300. 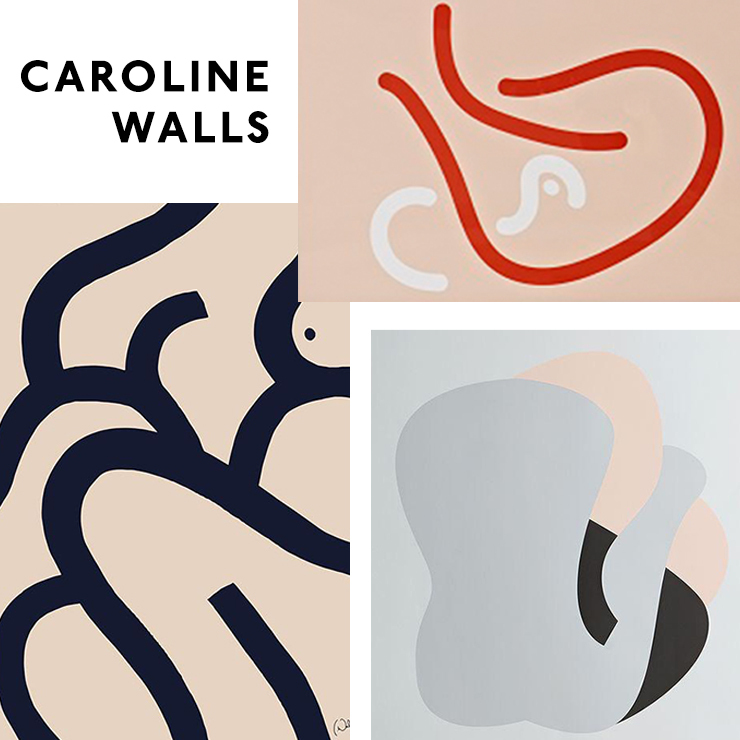 Using the female form as her primary subject, Caroline Walls works across painting, drawing, soft-sculpture and print-making to create modern pieces with a strong aesthetic. Her latest collection of prints ‘She Began’ depicts abstracted feminine shapes in black and off-white, and are all hand-pulled on Italian fine art paper, hand-signed and numbered by Caroline, with a very limited 25 available of each print. They’re going for $590 or $990 in pairs, while her paintings are pricier and tend to sell out at her exhibitions. Producing mostly large scale acrylics on canvas, Ashleigh Holmes of Milieu Collective uses colour, shape and movement to illustrate the beauty in all things natural. A lot of her work features abstract, but organic, shapes and a heavily layered, neutral palette, with splashes of bold colour and more distinct shapes appearing at times. While her work ranges from $600 to $4000, you can get a medium sized canvas for the pretty serviceable price of $1500. 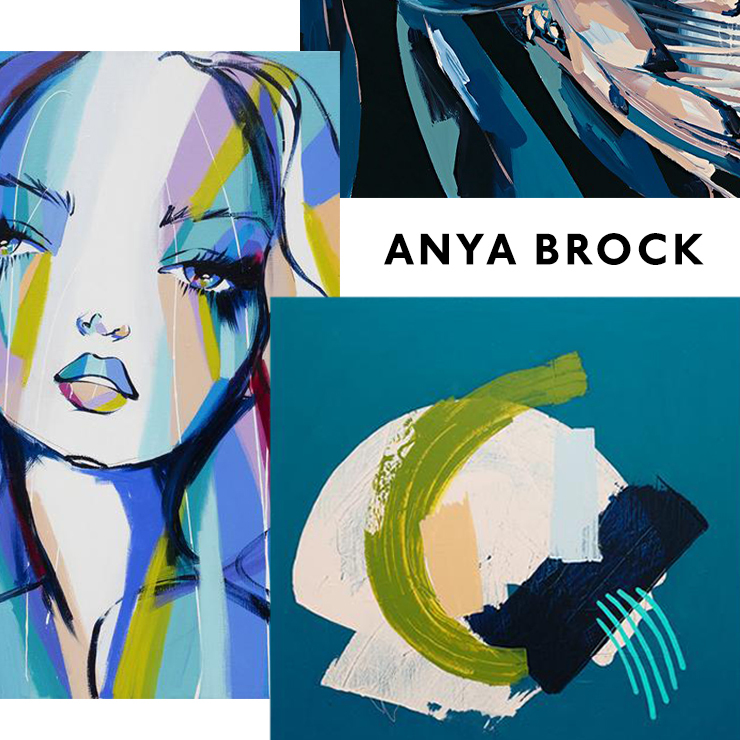 Anya Brock is a pretty iconic Australian artist, her close-up portraits, nudes, portrait-inspired animals and geometric compositions having appeared in some very public places—including a 10-foot-tall budgie mural in Perth that was featured in the New York Times. Her work uses bold, spirited colour and strokes, and often exaggerate, while not quite abstracting, her subjects. Her work is held in a gallery in Fremantle, but can also be purchased online—her original paintings (acrylic on canvas) range in price from about $1500 to $6000. Anya also creates and sells a striking range of Canvas Prints and Open and Limited Edition Prints that come in at a lower price point if you simply must get your hands on some of her work without the splurge. Western Australian Fine Artist Leon Pericles has been exhibiting work nationally and overseas since 1969. A witty and unique perspective on Australian life, Leon’s work is influenced by his life—growing up in Meekatharra, his Greek and Irish-Anglo ancestry, music, books, travel, kites, windsurfing, diving, and tending his seriously exquisite garden. His work is often bright and busy, combining a variety of mediums and reflecting Leon’s endless ideation and creativity—many of them are even based on and in his mythical town of Widjimorphup. Many of Leon’s works can be purchased upon enquiry, or you can commission yourself something special. Hailing from Denmark, Christiane Spansberg’s Picasso-like drawings have become somewhat of a sensation, especially in the worlds of fashion and design. Her one-line drawings depict faces and bodies, taking inspiration from ancient statues, architecture, museums and everyday life. You can make many of her pieces yours for around $4000, while some of her larger-scale pieces move toward the (dare we say it) $10K mark. Want more? Here are 8 interior design accounts you should be following on Instagram.